Concrete is no longer a dull, boring material. 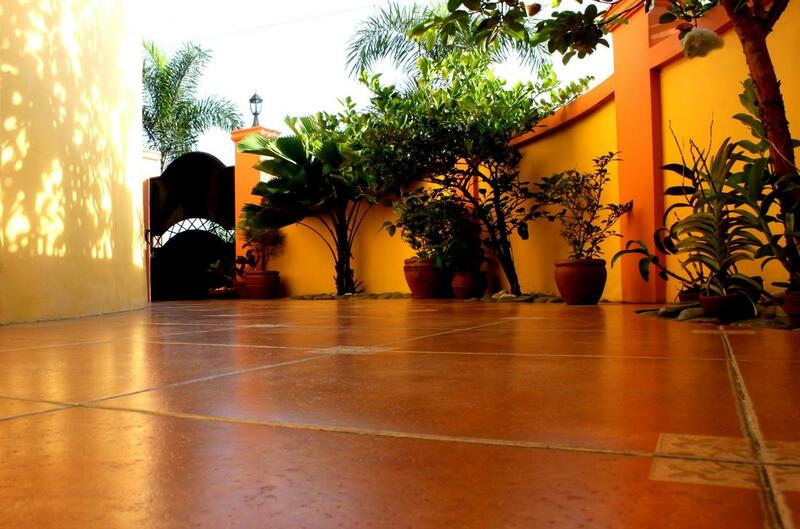 Now, there are all sorts of stains that can be used to enhance the appearance of your concrete. Our concrete contractors at Concrete Contractors Birmingham know how to develop some of the most attractive stains for your concrete. What a stain does that paint does not is produce a radiant color due to the materials of the concrete. It produces more of a translucent tone, which can vary change due to the type of surface applied to. This type of staining can resemble different things, like marble or some other type of natural stone. This is just one of the reasons it is such a popular application to have applied to your concrete stairs, patio, walkway or driveway. We work with two different types of stains, water-based acrylics and acid-based chemical stains. The acid stains consist of water, acid-soluble metallic salts and hydrochloric acid. The affect is produced because this stain mixture penetrates the surface and reacts to the chemicals creating the desired design. The acid is what is used to slightly etch the exterior of the concrete, which enables the metallic salts to easily permeate the concrete. When the stain begins to take affect, it is then a permanent fixture in your concrete that doesn’t chip, fade or peel. The colors of an acid-etch are typically earth tones. When you want a more vibrant look, this is when the water-based stains need to be used. They offer more of a variety of colors. They work similar to acid stains by penetrating the concrete. These types of stains can be applied to both old and new concrete. Our contractors often apply them to existing floors during a home renovation project. The stains usually add a completely new ambiance to the room. Hiring a professional concrete service to stain your concrete is best if you do not ant to risk wasting time and money. It is far too detailed to chance it on your own. There are some chemicals that simply do not mix well and should not be applied to concrete. If you want to be able to receive your desired results, you’ll have to give a professional concrete company a call to handle your staining needs. You will typically get what you pay for when you use the services of a professional concrete staining company. It is true that there are other concrete companies in and around Birmingham, AL, but none are as reputable as we are at Concrete Contractors Birmingham. This is because we hire the most talented team of concrete masons who take their time to make sure that their work is exquisite. We don’t produce garbage because we realize that our reputation is on the line. You deserve to receive the best and most affordable concrete staining in Birmingham and you can get it right here. Call us for your consultation today. We guarantee satisfaction.